The new play has started, it’s called “Quest for the Golden Puffle”. The costumes are amazing! There are some cool Ancient Egyptian clothes, a mummy suit & explorer clothes! 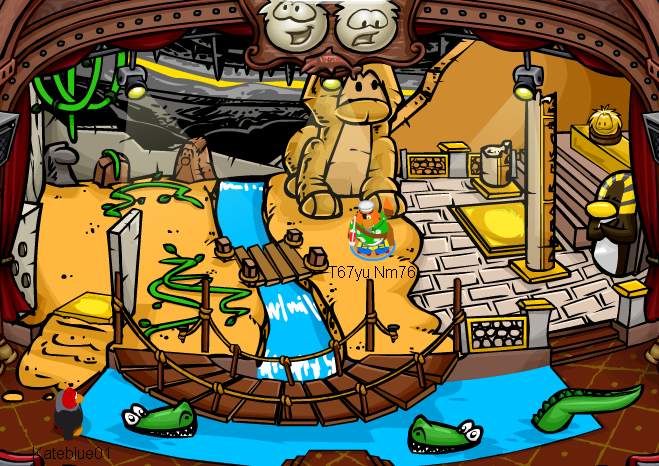 The Safari Hat, one of the first items Rockhopper ever brought, has returned though. There’s also a cool update to the Switchbox 3000: now other people can see some of the things you do on it! When I went into a crowded server, all I could see was all the traps going off! The switchbox has some cool features for this play. The golden puffle gets replaced by the yellow puffle if you pull the yellow lever, you’re able to make the bridges brake, you can start the snowball trap, & lots more! Go check it out. In my opinion, it’s the best play yet! There’s a pyramid pin at the Book Room. It goes really well with my mummy costume.